View More In Coffee Machines. 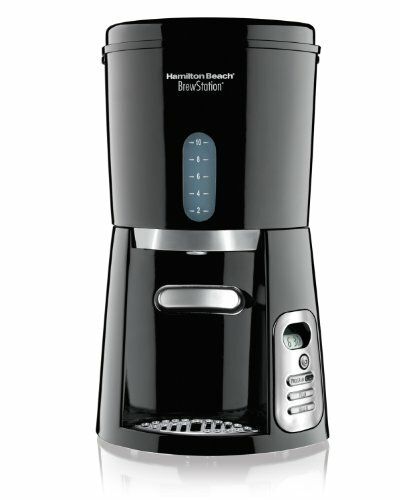 47380 Features: -10 Cups dispensing coffeemaker without a carafe. -Brews a full 10 cups and dispenses one fresh cup at a time. -No carafe means no pouring, no spilling, no breaking and no burnt coffee flavor. -Coffee stays fresh longer. -One-hand dispensing. -Gentle warming heater maintains coffee's temperature - no hot plate to scorch coffee flavor. Dimensions: Overall Height - Top to Bottom: -13.19". Overall Width - Side to Side: -7.88". Overall Depth - Front to Back: -10.04". Overall Product Weight: -3.97 lbs. Works like a traditional drip coffee maker but holds coffee in an internal tank. No carafe needed. Press bar to dispense. It's ready when you are.